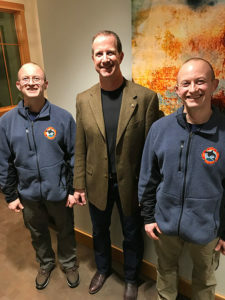 The San Juan Island Fire and Rescue Department is proud to announce the January 2019 Firefighter of the Month. In this instance, we actually mean, Firefighters of the month. Please join us in congratulating Firefighters Jerry and Dennis Sears for their consistent and humble service to our community and the Fire Department. There was considerable effort in picking which of the Sears was most deserving of the acknowledgement. However, since it is frequently difficult to tell them apart, whether they are in full firefighter gear or not, it was a tough selection. Both of the Sears brothers are equally active in responding to emergency calls, training and their work on behalf of department in our community. As a result of their hard work, the Department selected both of the brothers for recognition. Awesome job, Dennis and Jerry!! Thank you so much to all our amazing firefighters!